One of our most surprising discoveries about Las Vegas was the thriving local culinary scene beyond the famous Las Vegas Strip. Known nationwide for the comprehensive collection of celebrity chefs and world-class restaurants, Las Vegas is a culinary powerhouse. 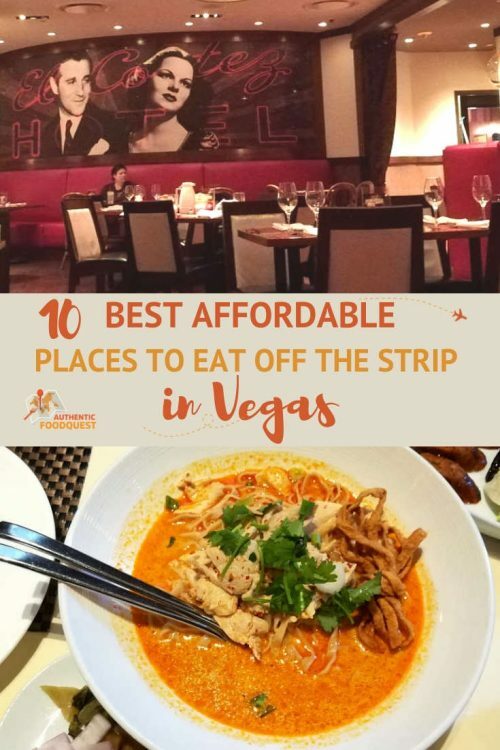 During our three month stay in Vegas, while housesitting, we focused on discovering the best off Strip restaurants in Las Vegas. Our goal was to find the local, unique and affordable places to eat off the Strip. Located in the less traveled part of the city, these Las Vegas restaurants off the strip are easily accessible via Uber or Lyft. We were amazed by the rich and varied growing culinary scene. Local chefs creating authentic “tastes of home” in the desert. Chefs using remarkably high-quality ingredients and rich flavors. We also observed a high level of creativity where “everything is possible in Vegas”. If you are looking to experience Las Vegas restaurants off the strip and immerse yourself in the local food scene, this is your perfect Las Vegas food guide. Downtown Las Vegas (DTLV) has seen a complete rebirth in the last 10 years. The downtown project has helped fuel many local businesses including new local restaurants. From Fremont Street to Container Park, the options are numerous. In downtown Las Vegas, you’ll find some of the best places to eat in Vegas on a budget. Container Park, an urban park, part of the downtown revitalization project, offers a mix of restaurants and bars, independently and locally owned. 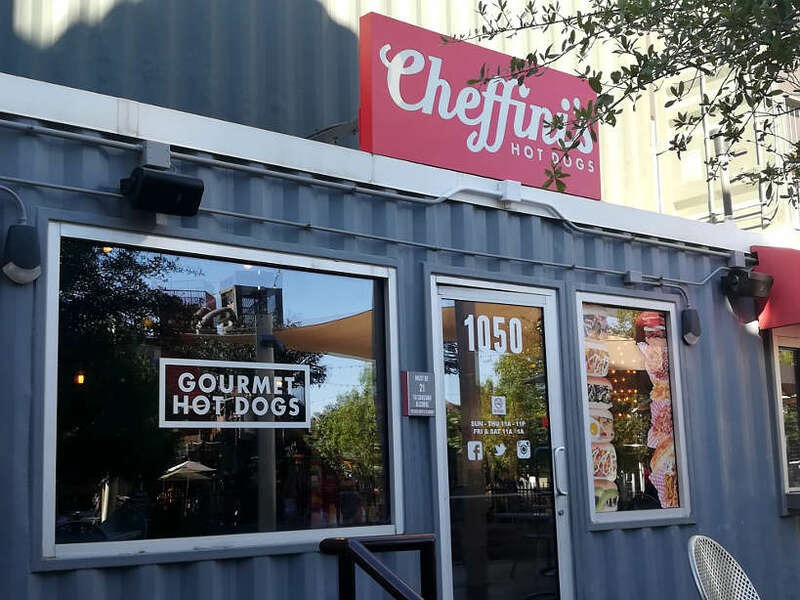 Cheffini’s was one of the first businesses to open its doors in Container Park. The co-founders first started their business in 2010 with a hot dog cart in downtown Vegas. Committed to putting a spotlight on this American food staple, everything they make is made from scratch. Famous for their unique sauces and toppings, Cheffini’s combines the classic hot dog with international flavors. 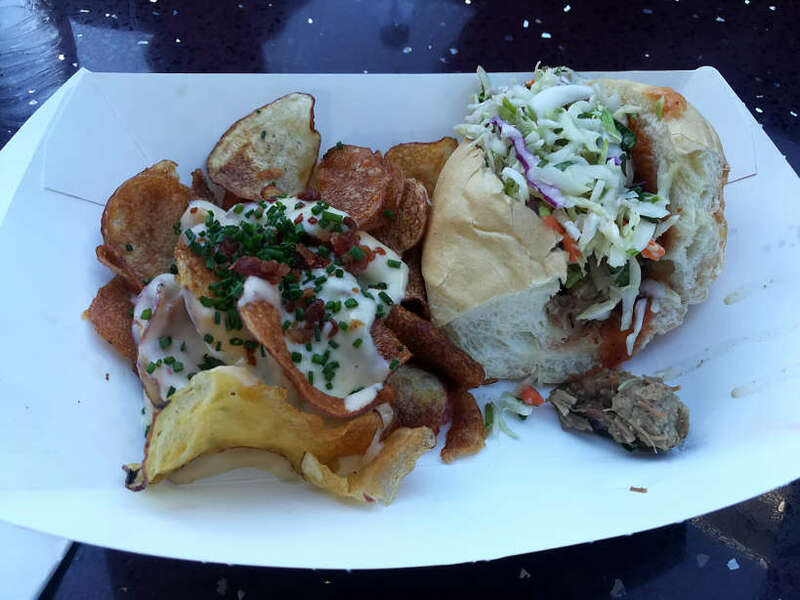 Cheffini’s has become one of the local favorites in Container Park. 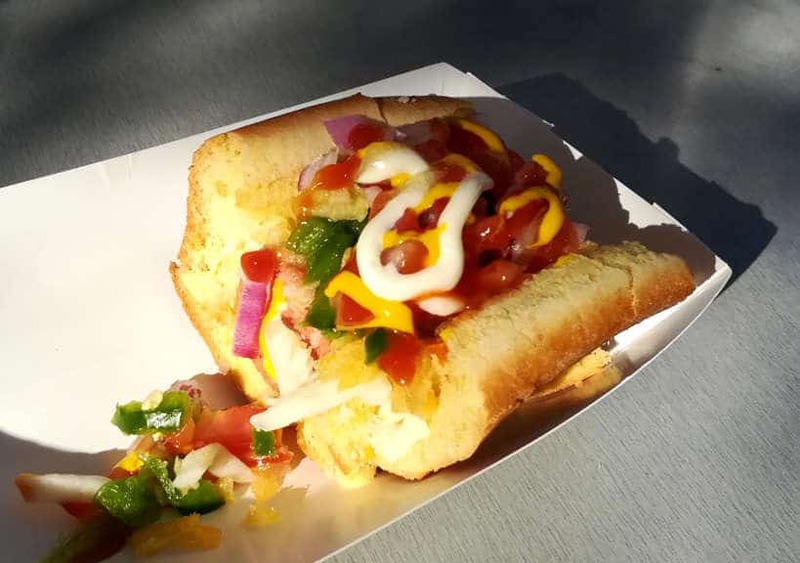 We sampled the classic Cheffini’s dog, which combines a nice bite from jalapeno peppers with a smooth finish from a tasty pineapple sauce. This is a great local place to eat on a budget while strolling around Container Park. Address: Container Park, 707 Fremont St #1050, Las Vegas, NV. Pro Tip: There is limited space to eat on the inside, go in between peak hours or wear a hat, sunglasses, and sunscreen to comfortably sit outside. In the center of the pedestrian walkway of Fremont Street, Experience you’ll find Project BBQ Las Vegas food truck. This permanent food truck stands out in the middle of the flashy casinos, entertainment area, and street performers. Using high-quality ingredients, this local spot started with the simple idea of offering “a great BBQ experience” in the Las Vegas desert. The barbecue sandwiches are made with either beef brisket, pulled chicken or pork. They are served with a side of homemade potato chips and coleslaw. The meat is seasoned with a homemade sauce which has beer and cheese in it. This unique food truck is a great option for lunch or a snack on while checking out all the entertainment on Fremont Street. It ranks high on our list as one of the best places to eat in Las Vegas on a budget. The barbecue sandwiches are delicious and overflowing with tender and juicy meat. The flavorful barbecue sandwiches reminded us of the best barbecue we had in Austin, Texas. With the order of chips served on the side and with the freshly made coleslaw, you’ll be in for a treat. The name says it all. At this local breakfast and lunch spot, chef, Natalie Young has a simple philosophy. Eat is about local food and fresh ingredients. It is also about fostering communities and education through food. Chef Natalie was one of the original chefs involved in the DTLV revitalization project. Her success has landed her many awards including one of the best restaurants for “seriously good comfort food”. On the menu, you’ll find comfort American food with a creative twist. Eggs are served all days and locals rave about the delicious egg sandwiches and the crispy pancakes. 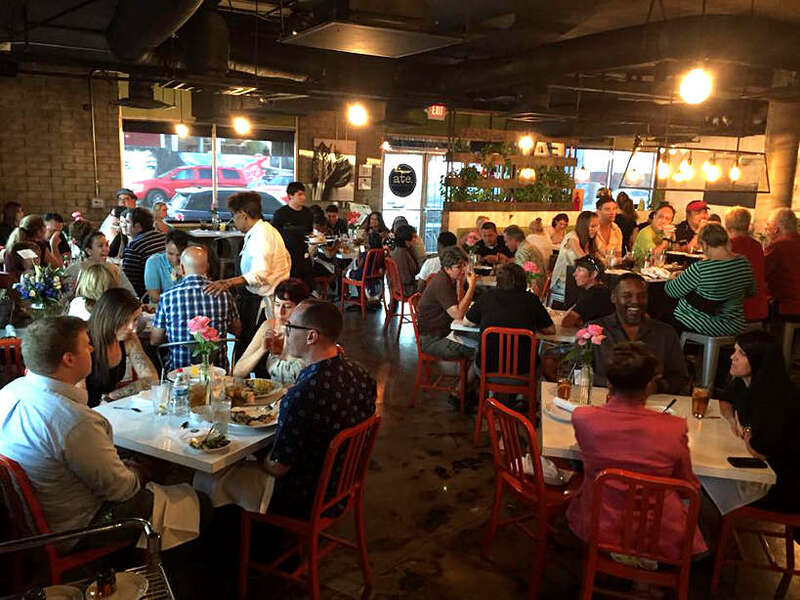 Locals rate this restaurant as one of the best places to eat off the strip. With her success, chef Natalie, recently opened up a second location in downtown Summerlin, a trendy local Vegas neighborhood. While Eat caters mostly to breakfast and lunch eaters, we were interested in tasting her cuisine at dinner. We chose to go to Chow her other restaurant in downtown Las Vegas. Unfortunately, we were misinformed and found the restaurant closed. Chow is now a space dedicated to catering events only. Running out of time in Vegas, we sadly didn’t have the chance to try Eat. Needless to say, this restaurant is high on our list for our next Vegas stop, and it should be on your list as well. Address: 707 E Carson Ave, Las Vegas, NV. Hours: Mon – Fri , 8:00 am – 3:00 pm; Sat – Sun 8:00 am – 2:00 pm. You can’t escape the casino experience in Las Vegas. 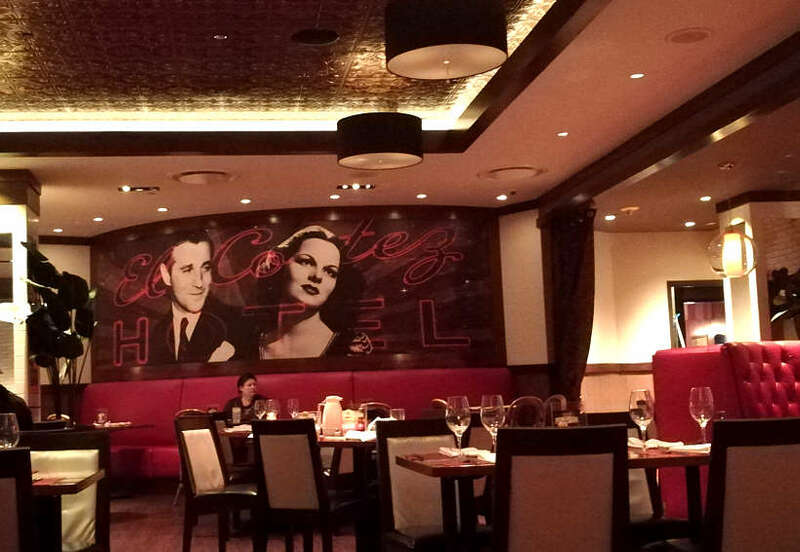 However, if you are downtown and looking for a unique “old Las Vegas” dining experience, the following two restaurants in historic casinos offer wildly different experiences. California Hotel & Casino known as “The Cal” to locals, is home to the best Hawaiian food in Las Vegas. The restaurant, Aloha Specialties located on the second floor offers traditional Hawaiian cuisine. Expect to find local Hawaiian fare like teriyaki plates, Chicken Tou Saimin, oxtail, rice bowls and more. This landmark hotel in downtown Las Vegas, just off Fremont Street, has a very loyal Hawaiian clientele. We were surprised to learn Las Vegas has a large Hawaiian population and it is often referred to as the 9th Hawaiian island. One of the popular Hawaiian dishes to try is the Hawaiian-style marinated chicken teriyaki. The chicken is cooked in chicken broth, ginger, and green onions. Served with a special Hawaiian sauce, you’ll be left craving for more. For a taste of Hawaii in the Las Vegas Desert, this is one of the best places to eat in Las Vegas on a budget. Address: 12 E. Ogden Ave, Las Vegas, NV. Hours: Sun – Thurs, 9:00 am – 9:00 pm; Fri – Sat, 9:00 am – 10:00 pm. Opened in 1941, the El Cortez bills itself as “the longest continuously-running hotel and casino in Vegas.” Located off the strip in the historic downtown area, El Cortez offers an authentic Vegas experience you just can’t get anywhere else. Part of the notoriety of El Cortez comes from the infamous mobster Benjamin “Bugsy” Siegel, who with three gangster partners owned the casino for a period of time in the 1940s. After the sale of El Cortez, Bugsy used the funds to build the Flamingo Hotel & Casino in 1947. In addition to its Illustrious history, the food at the 24/7 restaurant named Siegel’s 1941 is another draw. While on a downtown Las Vegas Food Tour, we learned from our local guide that the Prime Rib special at El Cortez was pretty good. Attracted by the casino’s historical significance and tempted by Prime Rib Special, we stopped in for dinner one evening. 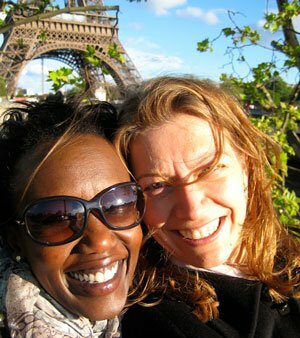 Seated in the dimly lit, updated restaurant, we ordered the $10.95 prime rib special and a bottle of wine, which was on special that day. This was a really nice piece of 8 oz. prime rib cooked perfectly medium rare, with a side of gravy and sour cream. For sides, you have a choice of french fries, baked or mashed potatoes. The meal comes with vegetables of the day, and in our case, a mix of broccoli, carrots, cauliflower and peppers. 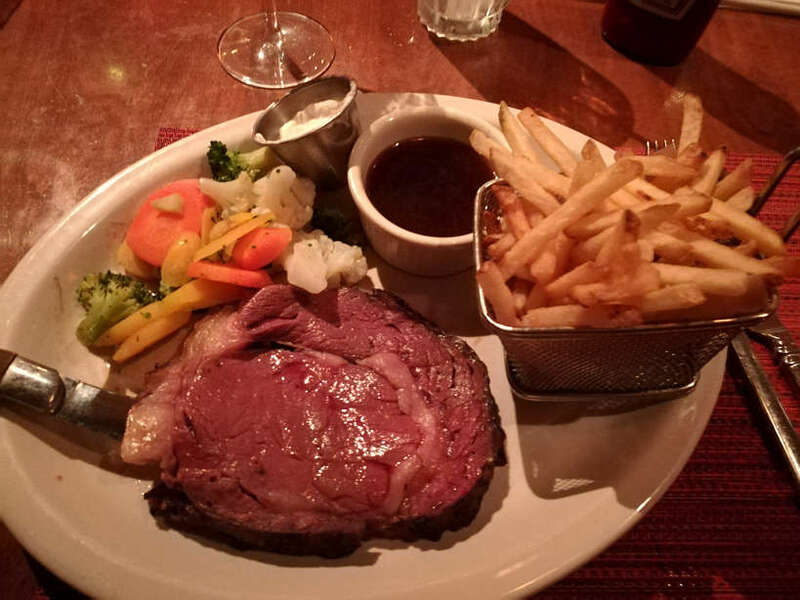 If you are in downtown Las Vegas and looking for one of the best places to eat on a budget in Las Vegas, don’t hesitate to have the Prime Rib Special at El Cortez. The beef was cooked to our liking and the vegetables fresh and crispy. With the friendly and attentive staff, you’ll enjoy a slice of Las Vegas for what it was, and what it is today. Pro Tip: El Cortize is the only casino to be placed on the National Register of Historic Places. Be sure to walk around after your meal. Food from Asia is one of the most vibrant and authentic food scenes to Las Vegas. Chinatown and the Spring Mountain Road vicinity is at the epicenter of this booming culinary scene. In this area, you’ll find diverse Asian cuisine including some of the best Asian restaurants nationwide. Lotus of Siam has been serving authentic Thai food since 1999. The chef-owner Saipin Chutima brings the northern Thai style cuisine to Vegas. After winning the James Beard award in 2011, her restaurant has been celebrated as one of the “best Thai restaurant in the United States”. Khao Soi and Sai Oua are the highlights of the Northern Thai dishes on the menu. The Khao Soi is a northern Thai soup with a rich and spicy coconut milk based curry. 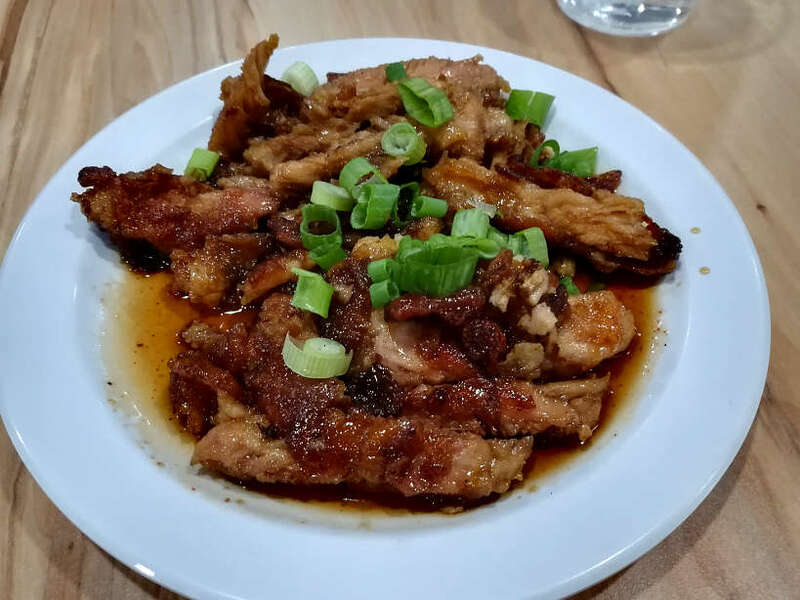 It is typically served with chicken or beef and two types of noodles. Sai Oua are traditional Thai northern-style sausages infused with a blend of spices and herbs. 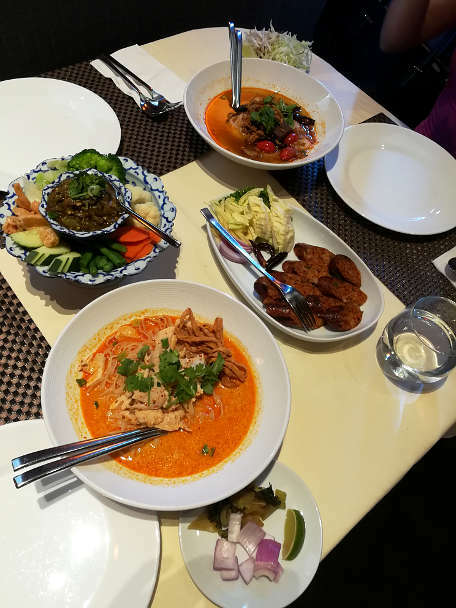 The rich flavors from these northern Thai dishes transported us back to Thailand. We were impressed by the taste and the quality of the ingredients of this restaurant in the desert, far away from the lush mountains of Chiang Mai. Pro Tip: If you are uncomfortable with spicy food, do not worry, At Lotus of Siam you can choose your meal on a heat scale from 0 – 10. Go for lunch for a better chance of getting a table. In Chinatown, Korean cuisine is gaining in popularity. 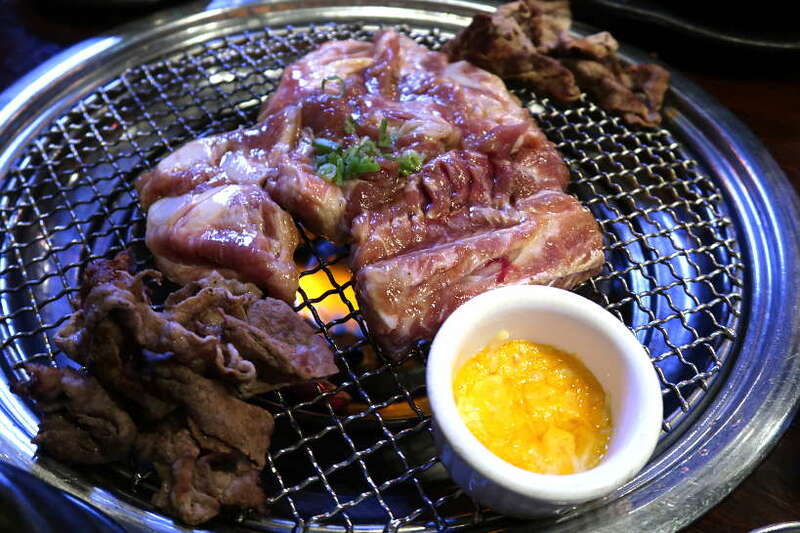 At the moment, Korean barbecue is the most popular Korean food you’ll find in Las Vegas. Hobak Korean BBQ is an authentic Korean restaurant, straight from South Korea where they operate several successful branches. 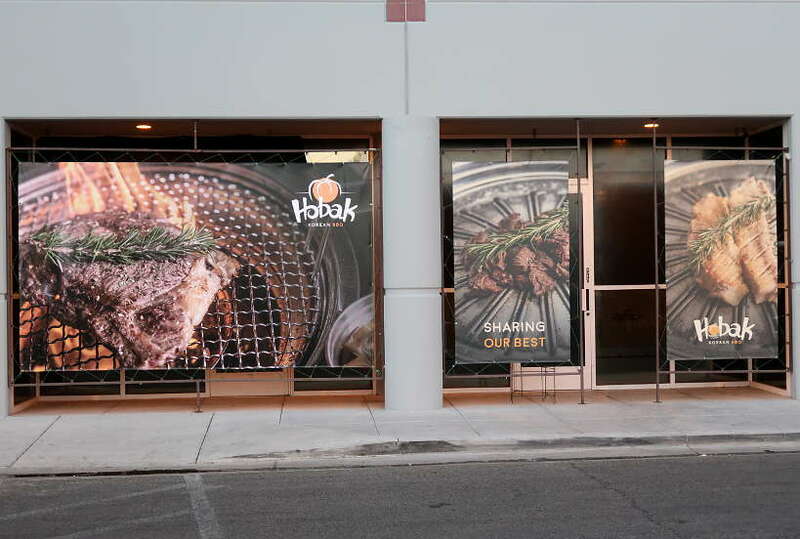 Hobak serves premium quality beef and pork cooked on charcoal grill at your table. With their combo menu, you can taste different cut of meats prepared in their own special marinade. Each combo menu comes with an assortment of side dishes also called banchan. Freshly cooked in front of you, the meat is incredibly tender and flavorful. The sides are well seasoned and make for the perfect accompaniment to the meats. This is one of the best places to eat off the Strip in Las Vegas and the delightful Korean BBQ feast is an experience not to be missed. District One perfectly embodies the diverse and creative cuisine you’ll find in Chinatown. It is one of the best Las Vegas restaurants off the Strip. While the menu is centered around Vietnamese cuisine, it also offers a mix of Southeast Asian inspired dishes. Known for their Pho, District One offers traditional recipes like Pho Tai Nam and more inventive dishes such as the Whole Maine Lobster Pho. We opted for the more traditional Pho Tai Nam that we enjoyed in Vietnam. This clear broth soup combines slices of ribeye and flank steak served with rice noodles. The fragrant flavors of the lemongrass, Vietnamese cilantro, ginger, and green onions reminded us of the Pho in Vietnam we enjoyed. With generous portions, Pho at District One certainly earns its recognition as the best Pho in Las Vegas. 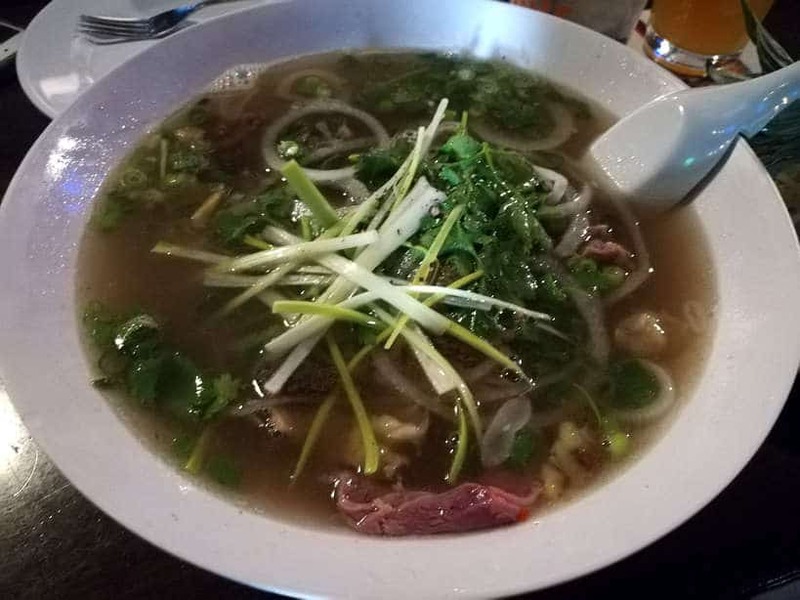 Where to eat the best Pho in Vegas! The buffet concept was pioneered by El Rancho Vegas in 1945. What started as a “chuck wagon” evolved to become the “all-you-can-eat” buffets. 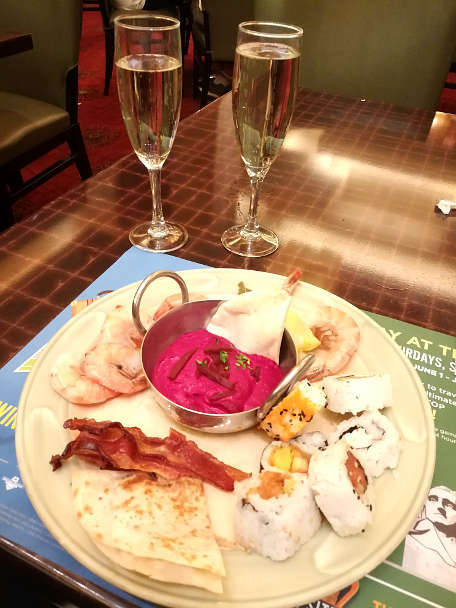 Today, the buffet tradition is still very much a part of the local Vegas food culture. Buffets have now gone gourmet with casino’s competing against each other for the best buffet in town. Many of the popular buffets can be found on the Las Vegas Strip and most come with a hefty price tag. If you’re looking for a local and affordable buffet experience, wander off the Strip and check out these moderately priced buffet experiences off the strip. Located in the Summerlin neighborhood, about a 30-minute ride from the Las Vegas Strip is Red Rock Casino & Resort, an oasis in the desert. Feast buffet, at Red Rock, has been voted one of the best buffets by Las Vegas locals. It is one of the best places to eat off the Strip. 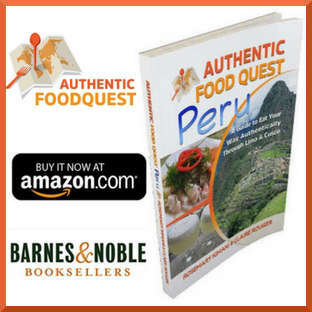 The diverse cuisine takes you on a culinary journey around the globe. The wide range of selection of food stations at Feast buffet is impressive. From Italian, American, Sushi, Barbecue, Asian, Farmers Market, Wellbeing and Pastries & Desserts, you have everything you could possibly want. With a personalized touch at each station, you can get your meal however you want it. At the carving area within the American Station, your meat can be cooked to your liking. The Farmers Market station goes beyond salads and toppings. One of our favorites was thinly cut slices of smoked salmon, of which we had several helpings. Find sugar-free options, and homemade gelato at the Pastries & Desserts station and you can also create your own perfect dessert. For a leisurely experience go for the Weekend Brunch and get champagne or mimosas included in the price. Since 2008, Mint Indian Bistro has been bringing authentic Indian flavors to Las Vegas. Even though Mint Bistro is not attached to a casino, it offers daily lunch buffets. Rated as one of the best places to eat in Vegas off the Strip, you don’t want to miss this local gem. With two locations, Mint is very popular amongst locals and not widely known among visitors to Las Vegas. 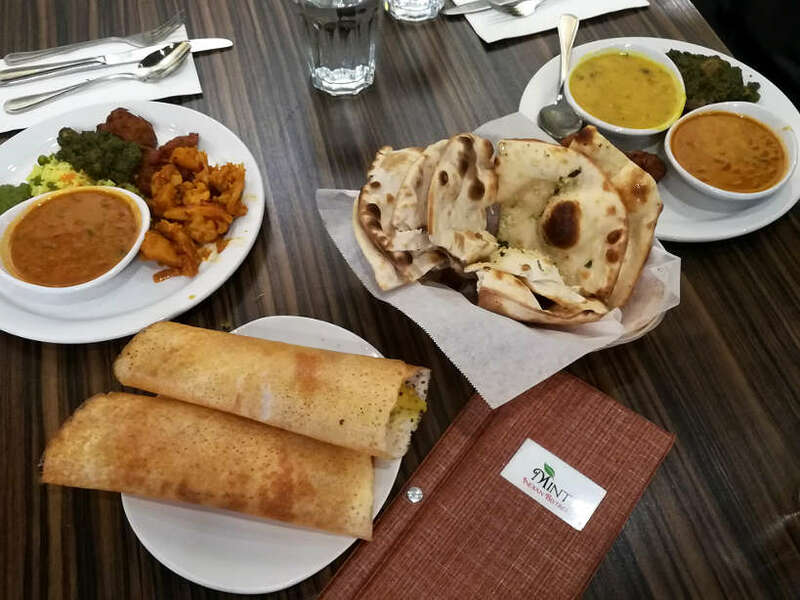 Catering to carnivores, vegetarians and vegans, this is the perfect place to sample simple, colorful, and flavorful Indian food that appeals to all senses. From the delightful start with freshly baked naan or Indian flatbread, you’ll be in for a sensorial journey. Stations with a wide variety of Indian flavors are found alongside the back of the restaurant. From favorites like the paneer tikka masala, a fresh goat cheese cooked in the creamy tikka masala sauce to classics like tandoori chicken, you will eagerly savor the rich flavors. The food at Mint Indian Bistro is surprisingly fresh and very flavorful. The diversity of dishes from India will appeal to all tastes. 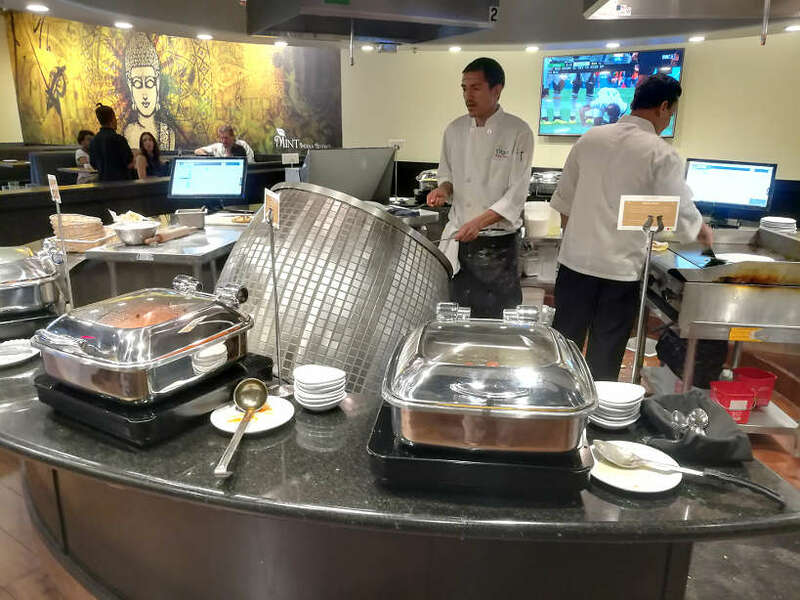 Don’t forgo this affordable unique buffet experience which is only about a 15-minute ride away from the Las Vegas Strip. Address: 4246 S Durango Drive, Las Vegas, NV. The food scene in Las Vegas is going through a transformation. While you’ll find restaurants from celebrity chefs like Joël Robuchon, Guy Savoy, Jose Andres, Gordon Ramsay, Thomas Keller and more, there is a quiet revolution taking place. A new restaurant scene is burgeoning right off the Las Vegas Strip. You’ll find many of the best moderately priced restaurants in downtown Las Vegas, Chinatown, and Mountain View Road as well as on the westside, in neighborhoods like Summerlin. For unique dining experiences, taste the flavors at any of the best places to eat off the Strip in Vegas. For a glimpse as to what to expect, play the video below and whet your appetite for the best Las Vegas restaurants off the strip. Have you eaten at any restaurants off the Strip in Vegas? In the comments below, please tell us your favorite places to eat off the strip in Vegas. For unique hotels with affordable and culinary options, book your Las Vegas off the strip at any one of these places. El Cortez – Located off the historic Fremont Street, this iconic downtown Las Vegas classic offers a unique and affordable experience. With recently renovated rooms and a convenient location, get the most from your downtown Las Vegas stay. 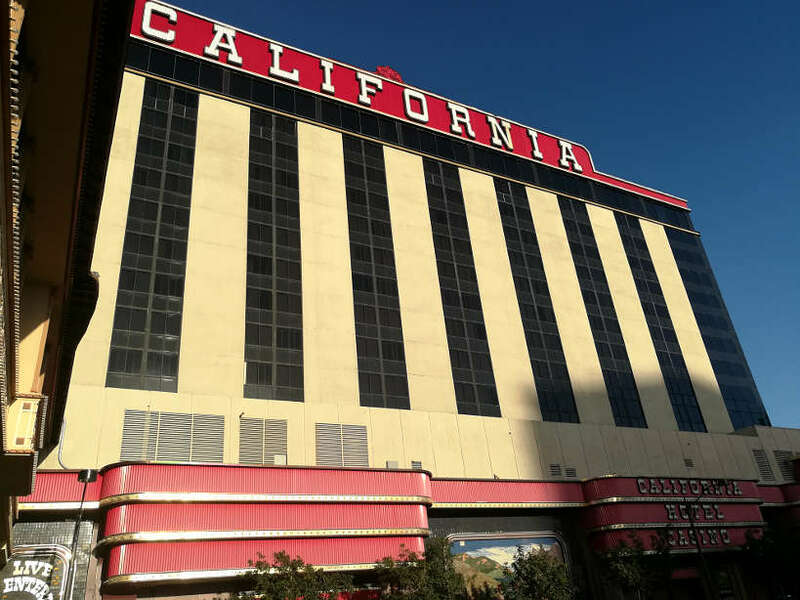 California Hotel & Casino – Known as “The Cal” to locals, enjoy Hawaiian hospitality. In additional to Hawaiian cuisine at Aloha Specialties, enjoy a variety of options within the hotel. Get the Oxtail Soup at the Market Street Cafe, savor a steak at Redwood Steakhouse, or visit California Noodle House. Indeed, we want to provide local off the strip places to eat for unique local experiences. Glad you enjoyed the article! Wow! It looks so… meaty! 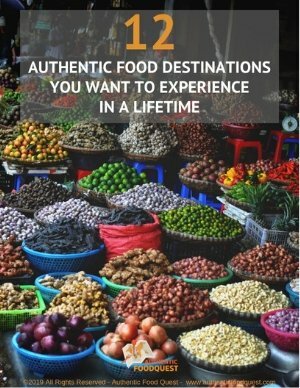 As a vegetarian traveler I would probably skip a lot of these places, but it sounds like Mint would be worth checking out if I was in Vegas. Did you notice any restaurants with a more healthy or plant-based vibe? Oh wow this looks like a foodies dream – SO much food to choose from! You better hope there’s a gym near by to work off some of those calories. Yum! Oooh Rosemary, this sounds perfect! Firstly, what an amazing place to house-sit! I am not sure I’d want to live in Vegas long term, but it must have been brilliant to live like a local for a few months. Especially because you found so many yummy things to eat! Oh my god, that picture of the deviled eggs looks so good. I recently went to Vegas for the first time but I missed all this! Everything I learn about Vegas always surprises me because I expect it to be so kitschy and stereotypical, but the art that comes out of there is so unique and proves me wrong every time. The rock bands are really good, and sounds like the food is, too! Indeed, Claire, the food in Vegas is not to be overlooked. There is so much good local food that only the locals know about. Keep this list handy for your next Vegas trip and prepare to savor the local flavors. All these places look so inviting. I would especially love to try Vietnamese flavours from District One. Hope to get the chance to explore Las Vegas and its culinary variety in the future. Great to hear Mateja. The food at District One is amazing and the flavors, just like in Vietnam. Indeed, hope you get to Vegas and District One soon. Yum!! Thanks for stopping by. This is such a great round-up of restaurants! So many people don’t venture off the Strip at all, but some of the best spots are the hidden gems off the beaten path. I especially love the idea of eating somewhere with an “old Vegas” atmosphere. You definitely gave me some ideas to try on our next trip. Thanks! You are most welcome Gwen. The idea is to get travelers to eat local and those local food experiences are often off the Strip. Do let us know where you end up trying on your next Vegas trip. Cheers. This is a good alternative to the VEGAS normal food!!!!!! I love curries all the way! I love the video! It brought everything into perspective! Please do more videos in the video. Thank you taking me to Las Vegas and back! Thank you Bonita. That’s good to hear that you want more videos. We’re working on that. Thanks for watching and for your feedback! Cheers. I should have read this post before our trip to LV last June. We didn’t go to any of these, but we did have supper at a Thai restaurant that I forgot its name. Coming from Asia, I would say they have authentic taste. If we go again, I would like to eat at Lotus of Siam and El Cortez. Not to worry, Umiko…I guess that means another trip to Vegas is due 🙂 So glad you enjoyed the article. 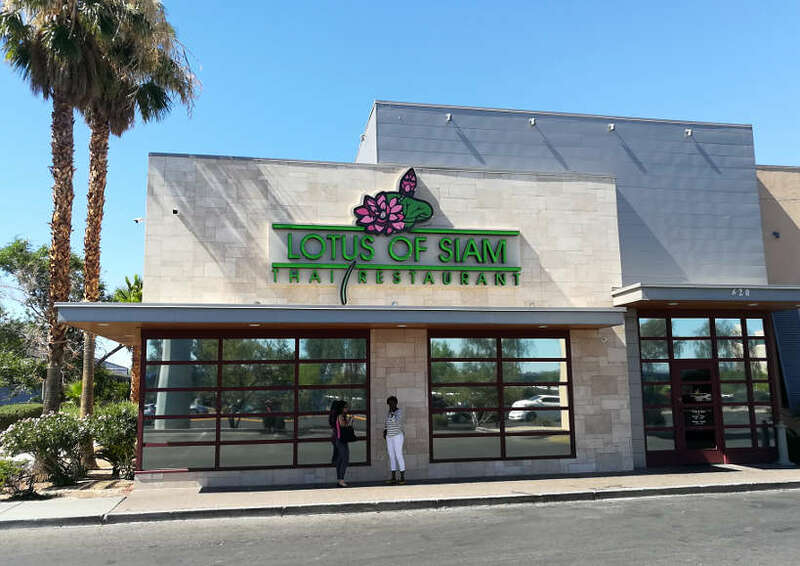 At Lotus of Siam and El Cortez, you’ll have two different and wonderful local food experiences. Cheers. What a great collection of food experiences you have had in Las Vegas! Housesitting certainly gave you a great chance to explore. I would not expect to find good BBQ in Vegas, but would try this. How interesting that you can find a restaurant with Hawaiian fare. The chicken teriyaki looked yummy. And a prime rib dinner for $10.95 can’t be missed! The rest are a great variety of international tastes. Great suggestions for affordable food! Thank you so much Linda for your feedback. Glad you enjoyed discovering these local restaurants. The food off the Strip in Vegas is amazing and it deserves much attention as well!! b) the Meal is unbelievable but I have to take out a 2nd mortgage to pay for it. 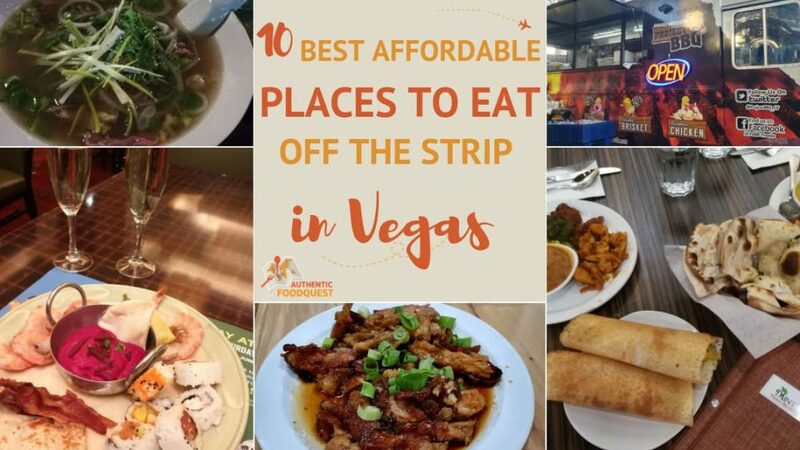 That is why I love your post of affordable places to eat off the strip in Vegas! I mean there are actual people that live in Vegas and they have to eat somewhere and I am sure it isn’t always in a casino so there must be a places. I love how you highlight EAT for breakfast and lunch. 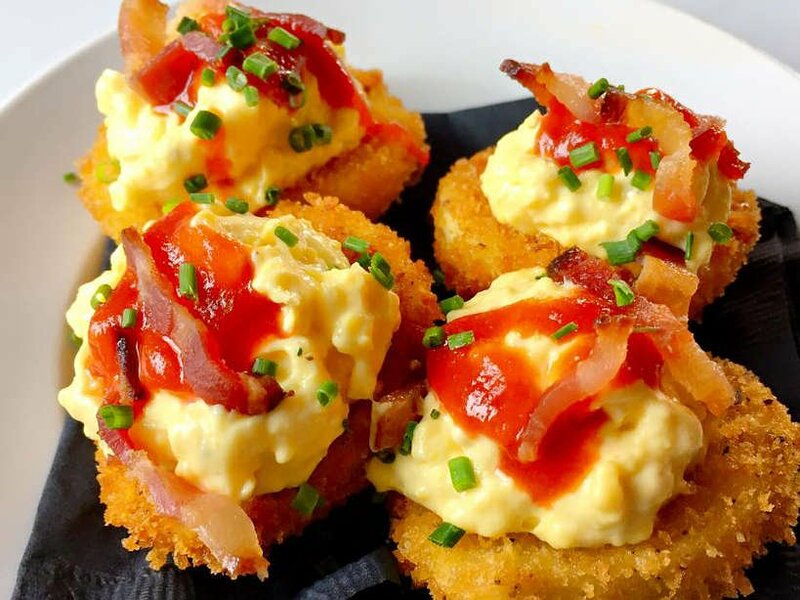 I have never heard of it but when I go back I am definitely going there for the different eggs…I mean those deviled eggs in your pic look off the hook! I also am going to have to check out Aloha in the California cause that looks really good too! Thank you so much, Eric, for your feedback. Indeed Vegas has more to offer beyond the Strip and we offer this list as alternatives to the Strip. Thanks for stopping by! Hey ladies, this is a great post! 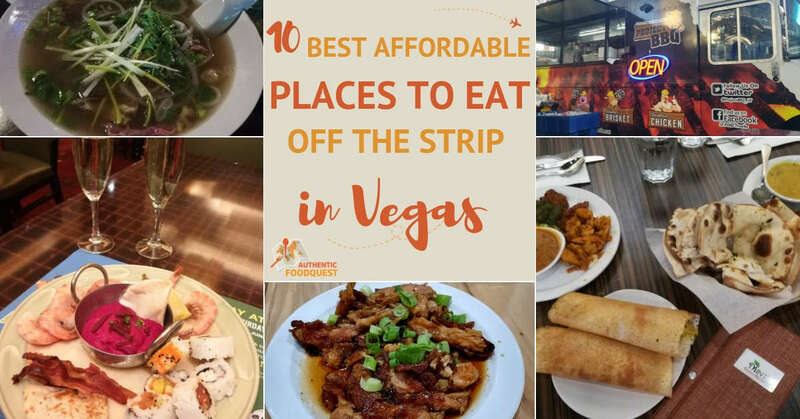 Every time we headed to Vegas, we ate at one of the well-known buffets or had breakfast at Denny’s, but never thought of going to one of these restaurants! Next time we’ll definitely try out the Vietnamese and Thai places, and eat a prime rib steak at El Cortez! Awesome ladies. So glad you enjoyed the article. There is definitively more to Vegas than the Strip. Let us know where you end up trying on your next Vegas trip. Thanks for stopping by. Thanks, Fiona, so glad you enjoyed the article. There is more to Vegas than the restaurants on the Las Vegas Strip. Hope you make it to any one of these restaurants soon!! Thanks for stopping by. You certainly won’t starve in Vegas It’s good to know there are so many options to dine on a budget in Vegas. I’m quite surprised at the selection of international fare. The Vietnamese Pho looks pretty authentic! So glad you enjoyed the article. District One in Vegas has authentic Vietnamese food and a sure bet. Definitively worth visiting on your next Vegas trip. Thanks, Christina for stopping by. I was waiting for an entry on authentic Japanese food! The only one of our faves not covered. 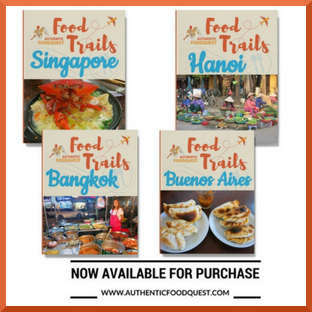 And, of course, I have several suggestions on the up and coming Filipino food! There is amazing local Japanese cuisine as well in Vegas. We didn’t get a chance to experience it, that’s why we didn’t write about it. We know it exists and perhaps a post for our next Vegas trip. Cheers. Thanks Danik. 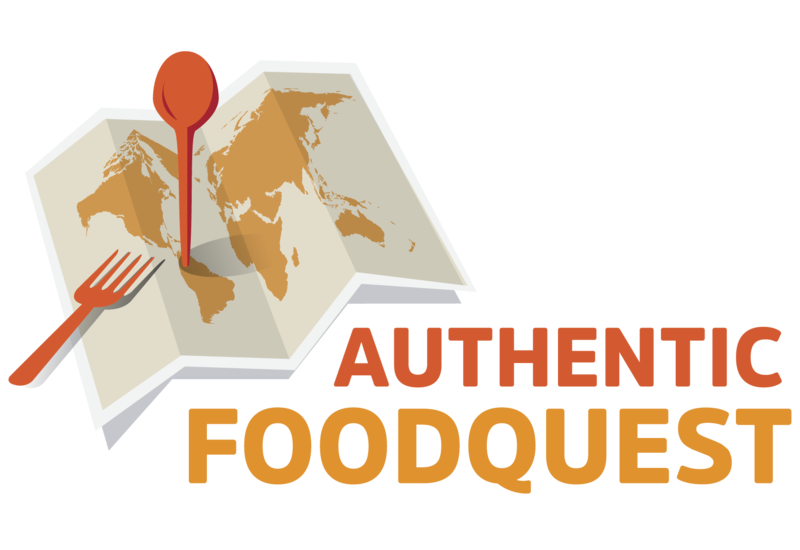 This food guide will be a great resource for your upcoming trip. Do let us know where you end up eating 🙂 Thanks for stopping by. Now I’m salivating! As much as I looove to try all these restaurants in Vegas (to satisfy my inner foodie soul) I would want to try to visit Asian Restaurants there first. The Khao Soi Thai soup looks inviting especially I love anything spicy! I will definitely visit Lotus of Siam as you recommended. I’ve also visited Seoul and been to few recommended Korean barbecue restaurants there so I can’t wait to try Hobak in Vegas! Thank you for sharing this amazing list Rosemary. You are most welcome Carissa. So glad you enjoyed discovering the Asian delights in Vegas. 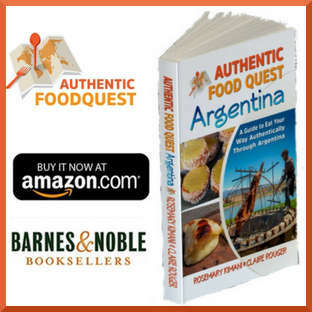 There is so much good food with authentic flavors….you’ll not be disappointed. Do let us know which restaurants you end up trying on your next Vegas trip. Cheers. That brisket looks good. And those deviled eggs look appetizing! I am hungry now, thanks to you. Oh my gosh, some of the places you mention brings back some memories! I lived in Las Vegas for six years and went to college there. 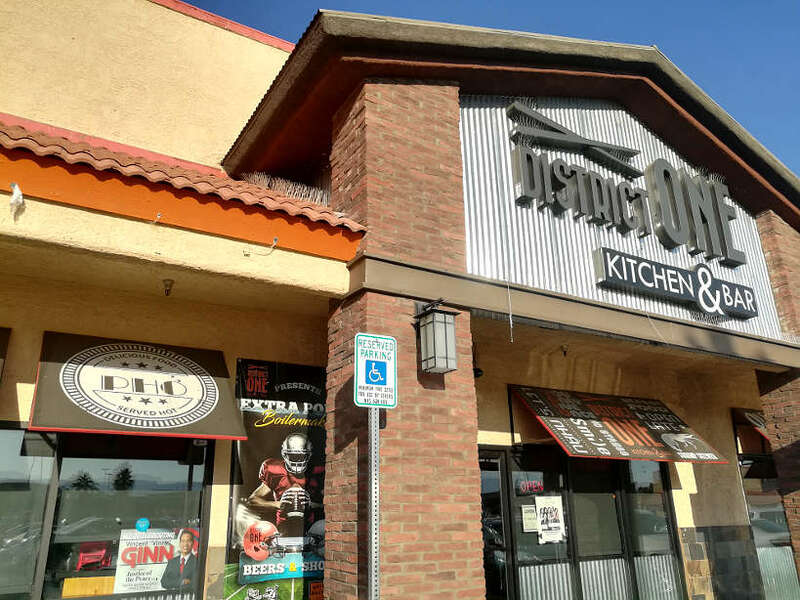 It’s not the one you mention, but Aloha Kitchen across from UNLV was totally our jam! My Hawaiian dorm mates introduced me to it and now I’m totally craving the bowls we used to get there. Lotus of Siam is a total local secret. It looks like you went to the newer second location. The original really isn’t far off the Strip, but tourists never ever found their way there since it is hidden in a strip mall and just looked like one of those places to pass up. I also have to recommend El Torito Cafe. This Mexican restaurant is owned by my first college roommate’s mom and the food is incredible. I’ve not had a chile relleno as good as Denise makes them at El Torito Cafe anywhere else. That’s wonderful to hear Jennifer. Didn’t know you went to school in Vegas. The Hawaiian cuisine is the best and one of our favorite local food discoveries. Good to know about El Torito Cafe. Keeping this one in mind for our next Vegas visit. Thanks for the tip and for stopping by. Cheers. I think buffets are the best thing about Vegas. I’d never heard of Feast Buffet before but it sounds great! I would totally love a buffet that has it’s own “pick your own” cooking station. Plus a weekend brunch featuring champagne and mimosas? I am in! Perfect!! 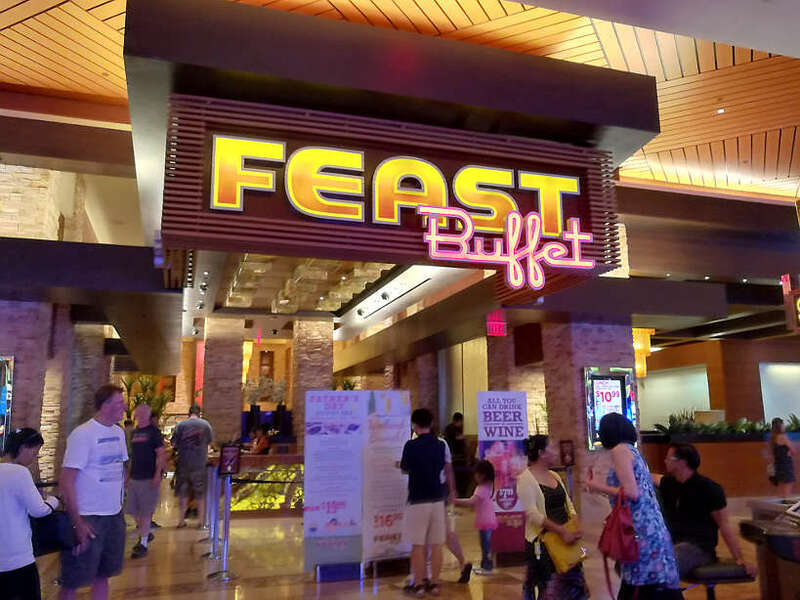 Check out Feast Buffet on your next Sin City trip for an enjoyable and local experience. Thanks, Sav. These look awesome! We lived in Vegas for two years and moved to South Korea right afterward and would have loved to hear about Hobak in either place! That is part of the beauty of Vegas though, there are so many great dining options! Wow these all sound great. I havent ventured much off the strip except to Freemont, I am going in Feb, so will have to check these out, thanks for sharing! You are most welcome Valerie, the food scene outside the Strip has much to offer and it is also much friendlier on the wallet 🙂 Do let us know where you end up trying. Cheers. These all sound really great. I was in Vegas about 7 years ago but we stayed on the strip. Next time we will have to venture out. Las Vegas has so much more to offer for food beyond the Strip. Highly recommend venturing off, the next time your travels take you to Sin City. Cheers, Holly. I only wish this article came out two years ago! I spent about all my time in Las Vegas on the strip and needless to say it was – so – expensive. And now I just had a meal, and I still want to eat everything here, yum! Even though you didn’t have the article before your Vegas trip, it’s out now and ready for your next adventure in the Sin City. Eating off the strip is much more affordable and quite authentic. Venture off and explore more on your next trip. Thanks for stopping by.